One of the most gladiatorial footballers in the modern era is also a fantasy star. Ben looks at the two-time Norm Smith Medallist today. One of the most gladiatorial footballers in the modern era is also a fantasy star. Two time Norm Smith medallist Luke Hodge had his third best fantasy season average last year and is now ranked as the most expensive back heading into 2015. Considering that he went above 100 in 47% of his games last year, including 4 scores above the 120 threshold, the ‘most expensive’ tag is certainly deserved! Couple that with only 2 scores below 70 and you’ve got numbers consistent with the best fantasy backs of the last decade. Whilst preseason gospel is notorious for pumping up every players tires, it still came as a welcome relief to see Hodge perform all of the various conditioning exercises to this stage. In an absolute rarity, Luke has managed to avoid post-season surgery which should also be a great help to keeping this warrior on the park. With the Round 12 and 13 byes heavily stocked with backs of interest, Luke’s Round 11 bye should prove to be very important to many bye structures. Simply put, Luke will be a top 6 averaging back and paying the top price may well be worth the peace of mind. As the Drawing Board numbers (over on DT Live) currently stand, just over 28% agree. The reasoning for not picking him is quite simple, injuries. For the past 7 season straight Hodge has not managed to play out a full season, having missed 31 games of H&A football in that time. In 2014 he battled a variety of knee, ankle and sickness complaints and this trend is unlikely to cease anytime soon. Given Luke is now the wrong side of 30, coupled with the fact that he’s maintained his brutal style of football throughout his 261 games, Hodge will miss games in 2015. As I suggested in the Brendan Whitecross article, there’s a lot of competition off that half back line. When considering the depth in that position it’s an absolute no-brainer that Luke will be rested this season. How many rests he receives is the big question, but this’ll clearly deter many from picking him. Another issue for many will be the fact that Hodge doesn’t have real potential to increase his average from last seasons. He has no upside and in all likelihood, he’s going to drop off in his average after such a herculean year in 2014. Whilst you’ll still be purchasing a top 6 back, for that price it may be worth waiting for a drop off in price. KING. Hodge is a fantasy beast and this season will prove no different. Whilst the price may be steep, at least you can bank on a solid 90+ seasonal average and a fairly consistent production of 100+ scores. Whether you start with Luke or not, he’ll come under consideration at some stage during the season. For non-owners it’ll be difficult to watch if he gets on a run like he did between Round 14-21 where he smashed a 105 average. Whilst buyers must beware the injury concerns, sometimes playing it too safe can lead to your downfall as well. Back your gut on this one fantasy nuts! 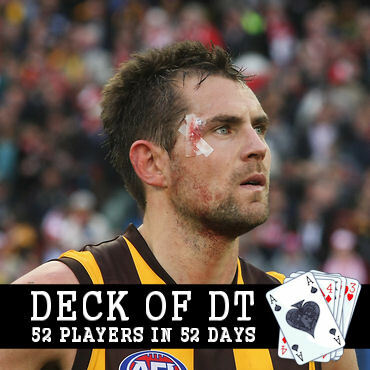 What are you plans with Luke Hodge? Great article Ben! I agree with everything you said. The rests are not much of a concern for me, will get you a 85+ score and often a sneaky 130, I’ll just put him on my bench but the price of 550k is. In SuperCoach he is 497k, which is a no doubt lock. 550k though is just too expensive for me. He will get you the points 100% guaranteed, but the price is just too much. I’m looking at Malceski, 30k less, as he has an easy 6 round lineup, and scored 100+ against each team last season. Will be a tough one, but 30-50k less and he is a lock. I might lock him in to the midfield, allowing a handy DPP. Great article Ben, absolute lock for me. I know he won’t improve his average, but I don’t care. He’s an absolute warrior and will be the first picked in my backline. Ben you said “Luke Hodge had his third best fantasy season average last year”. I think you’ll find 2008,2013,2014 have been his best years….funny how they mirror our premierships!! !Hope he has his best year yet. I have a question about the first round. First lockout will be before the Carlton Richmond game on the Thursday. Will it then be rolling over until the Melbourne GCS game on the Saturday? There are so many Demons players who I am keen on (Salem, Hogan, Petracca, Newton, Vandenberg) and it would be a huge advantage to be able to see the team and sub before the final deadline.